First, this is my 300th post, which is kind of wacky to me. So, um, yay! I have no idea how this is the first time I have seen this tank, as I generally know Old Navy's inventory like the back of my own hand. But, somehow it's already in the clearance section! 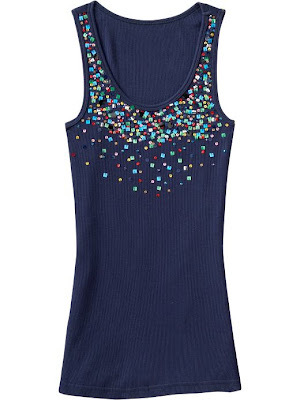 It'll go with everything with all that multicolored sequinage. And I just really want one. Apparently I have a sequin craving that should be satisfied, and that's cool, because apparently sequins are "in" or whatev. Find it for just $7 (Orig. $14.99) here (limited sizes also available in black). It's not clearance. I went to ON a few hours ago, and it's the "deal of the week" along with the ruffle tanks on the table at the front of the store. They're cute, but I don't know if I really like the multi-colored sequins. One color of sequins would have been nice. Ohh, Ahh! But I wish that the tank wasn't ribbed. Somehow I can't do a ribbed tank. Too wife-beater. I know, I'm weird. Other than that, I love it! Oh deal of the week! No wonder it snuck under my radar! Yes, Amy, I know what you mean about the ribbing. Why could they not do this on some other fabric? They also have a really cute ruffle tank, and that is ribbed as well (which I think is totally cuckoo, ruffles on ribbed fabric?!) The sequins on ribbed fabric doesn't bother me as much, but it could have been better! Definitely heading over to ON.com!! Happy 300th post day! Whoo-hoo! I love the top- thanks for the tip. I also love ON's yoda clothes- so great for so many things and not so frumpy as sweat pants. congratulations I love to read them and I have learned how to stretch my dollar and look great! I saw this in person at ON yesterday, and it doesn't look as cute in person as it does on the Web. I don't know why, but it just looked a little cheap/homemade to me in real life.